I am a horrible mother and have not taken the time to post pics of Mallory's 5th birthday. (How is it even possible that she is 5?) We had a great time. On her actual birthday we just hung out at the mall and ate with some friends. However a few days later she was able to go to Chuckee Cheese and play and eat cake! I am just thrilled to see the young lady she is becoming. I hope that God will start working on her heart and draw her unto him! Happy Birthday to My Sweet Makenna!! So, we watched the movie Santa Buddies last night with the girls and Conner. Well actually Conner just did a whole lot of cooing at the Christmas tree. Anyway, I was amazed to find that a Disney movie had a prayer in it. Granted it was a dog praying but it went something like this. This poor little homeless puppy found some food in an alleyway and stopped looked up to the heavens and said "Dear Lord, thank you for this unexpected blessing Amen!" How very very cool is that? In other news, Conner's face is looking worse everyday. The doctors tells me it is normal but it has started bleeding, and scabbing all over the hemangioma. I am very paranoid when it comes to my babies, and it is horrible to see little man looking so pitiful. 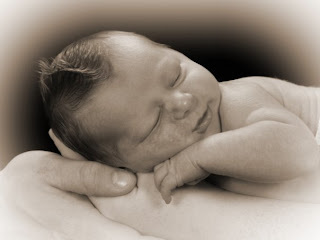 And I can tell that it is becoming more painful, Conner hardly ever cries, but his new recent cry is just so sad. Please keep him in your thoughts and prayers. Just wanted to post these pics of our little man. The first one is from when he was two weeks old. He is headed to his very first Sunday morning church service!!! This was the Sunday we dedicated him! The second was taken today, 7 weeks later. I was amazed at the progression of growth on his face. When you see it every day it doesn't seem to be growing but the change is very apparent in these pics. Tuesday we had our first appointment with Dr. David at Baptist hospital. I am still just overwhelmed at all the information we learned. Some of this was very good news, and some was confusing news...but all in all it was an informative appointment. Let me see if I can condense the whole appt for times sake. First of all we were told Conner does not have a port wine stain. His birthmark is a hemangioma. It is a benign tumor that will rapidly grow for the next 12 to 15 months and then taper off and begin regressing. Also the "infection" that has been seen by 5 doctors, is not really an infection at all. Don't get me started on how helpless that feels to know that your child has been misdiagnosed by 5 different doctors and that the treatment I have been doing for 17 days now was probably hurting him. Anyway, the sores that are on his face are the result of the skin breaking down due to tumor growth. Basically the tumor is growing so fast that the skin is not able to keep up with it. Or at least that is the closest I can come to explaining it. Right now they are incredibly concerned about keeping the ulcerated area from becoming infected. That means if you happen to see me out don't be surprised if I am hiding Conner. The best course of action is to keep him quarantined from everyone so he doesn't get anything into the open area. The doctor was also very concerned about his eyes. 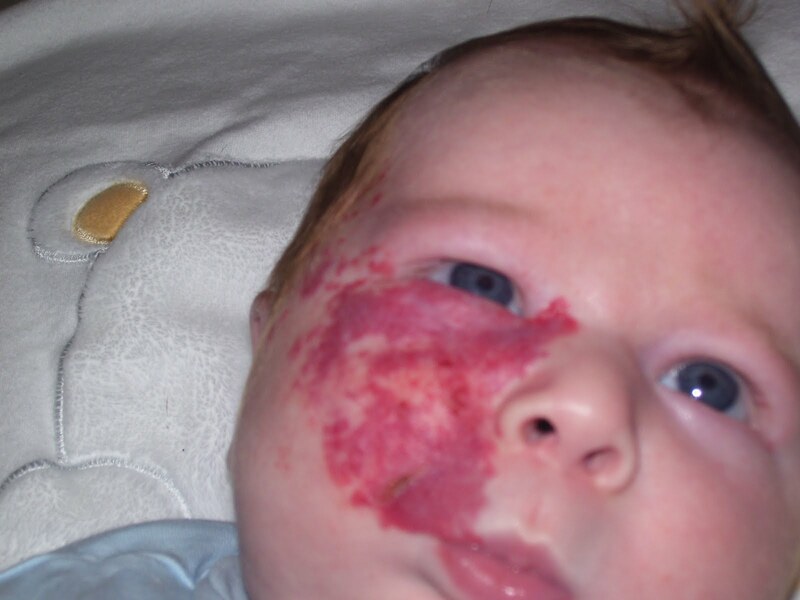 With the hemangioma being so close to his eye there is a possibility it can cause a "lazy" eye. In an infant if their vision is blurry, the infant will start ignoring that particular eye and in turn lose the use of it. Thankfully when they sent us on to a pediatric opthamologist in Greensboro, Conner was given an eye exam which was almost completely normal. YAY!!! He has a slight astigmatism but nothing to be concerned about at this time. We will return in four months. Starting December 12, Conner will return to Baptist for his first of many laser treatments/surgery. Normally doctors take a "wait and see" approach, but because Conner's is already breaking down they want to treat it aggressively. The really great news was that this new type of birthmark is not in any way associated with the syndrome that causes brain damage. So no more CT scans! We feel very blessed to have Conner in our lives, and although right now I cannot see the big picture and I definitely do not understand why God has chosen this path for us, I still can only say that we are blessed. As I have been researching these birthmarks I have seen some truly heartbreaking pictures and read some stories that made me want to just hug these little babies. It could be so much worse. So I am going to keep a positive attitude and remember that it is HIS hand and not mine that is leading our family right now. Hello my blogging buddies! I have neglected you all in the past little bit, but I have been keeping up reading about everything you all post. My prayers and heart have been with you even when my comments have not. I only have a minute, but I am hoping that you all will join me in praying for Conner. 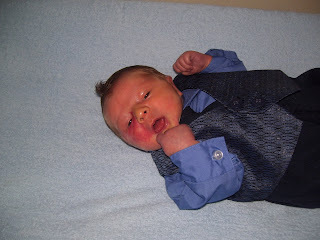 As you may know Conner was born with a port wine stain covering most of his right cheek. At first we were told it was bruising, then later a birthmark associated with Sturge-Weber Syndrome, and then now we are being told it is simply a cosmetic disadvantage. How blessed we feel to know that although God would have still been gracious had Conner been diagnosed with brain damage, our Lord chose not to lead us down that path at this time. We will continue to monitor him, and repeat CT scans and X-rays as he grows. Now for my prayer request. On Tuesday of this coming week Billy and I will be traveling to Baptist Hospital in Winston Salem in order to consult with a plastic surgeon. We have been informed that there is a laser treatment that will help remove, or at least fade the appearance of the stain. Hopefully that will allow Conner to face childhood, adolescene and his adult life without the hurtful remarks of curious people. I am not positive what this first visit will include, but later visits will involve general anesthesia on such a little fellow. Right now our prayer is that God will heal the small infection that is on his cheek and guide the physicians as they counsel us in this desicion-making process. I know that when Conner was born and in ICU I could feel your prayers surrounding my family. Although I feel selfish to ask for that same fervency for a cosmetic procedure, it would be such a blessing to our family to know there were such Godly ladies praying with us. Thank you for being my friends. Much love to you all. I am so blessed! I am saved by God's grace, happily married to the man of my dreams, and love being a mommy to two beautiful little girls, and one precious baby boy!